Ages 14-18 (must be in high school). Introduction to Afro-Latin Percussion focuses on technique and learning to play as part of an ensemble. 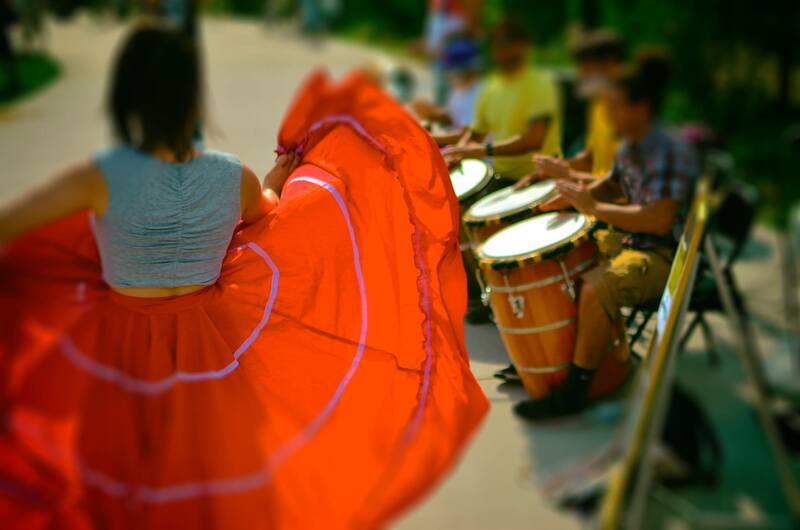 Rhythms covered include Afro-Cuban Guaguancó, Puerto Rican Bomba and Colombian Cumbia. This course is a solid foundation for Salsa and Latin jazz percussionists. Application link available soon. Email info@srbcc.org or call 773-698-6004 and ask for Michael Rodríguez for an interview any time of the year. Graduates from this program are regularly invited to perform in professional gigs with SRBCC’s family of artists and instructors. Teens in our programs earn stipends. For teens who successfully meet certain program requirements (including attendance and participation), After School Matters provides them with a monetary stipend. Stipends lower participation barriers, reinforce the importance of dedicated participation and hard work in programs, and make an economic impact on teens, their families and communities. Providing stipends to our teens empowers them and reinforces the value of their time and efforts.